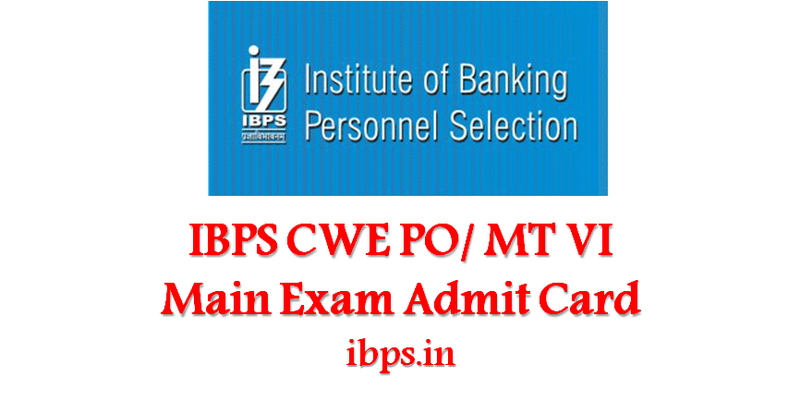 Admit cards been released for IBPS CWE PO/MT 6 main exam. Candidates who have qualified for the exam can download the same at the official portal of IBPS at ibps.in. Institute of Banking Personnel Selection (IBPS) declared the preliminary result of the common written examination held for recruitment to Probationary Officer and Management Trainees. Only those candidates who have qualified the prelims are eligible to appear for the main exam. IBPS PO main exam will be held on 20 November 2016. Candidates who qualify the main examination will be required to appear for interview. Though exact date has not been fixed by IBPS, but tentatively the interview session will be held in January 2017. Provisional allotment process under IBPS for PO/ MT posts will be completed by April 2017. Call letter for the PO/ MT main exam is available online. How to download IBPS PO main exam admit card? Important Note: Candidates are required to bring the printed form of the admit card to the examination venue, failing which, will not be allowed to sit for the exam. In addition to this, candidates are also required to bring ID proof. Details of the examination venue and timing will be mentioned in the admit card. Candidates are suggested to reach the venue well in advance of time. About IBPS PO exam: IBPS is an autonomous organisation which conducts recruitment examinations for selecting eligible candidates for PO, PO and Specialist Officer posts. A total of 20 banks are participating for the IBPS CWE 6 for PO/ MT posts.